Why are there no hire prices on the website? Hire charges depend on your location and the duration of hire. Please call us using our local rate number for any enquiries, or contact us via email. Responses to any emails or telephone messages left are aimed to be dealt with, within a 12 hour period. A £100 deposit to secure your booking is payable by cash, cheque or TT transfer upon receiving back from you a signed copy of our terms and conditions and booking confirmation. The balance is payable either in cash or cheque one week prior to the day of the event, or if agreed in advance, upon our arrival at the event but prior to our set-up of the equipment. Rodeo dimensions require 15ft x 15ft diameter and 8ft height with single door way access. Is your equipment up to HSE standards? All our equipment is fully insured and carry current safety certificates (please see our Safety and Insurance page). Are children allowed on the ride? Due to current HSE standards and our insurance premium, children under the age of 10 are currently not allowed on the rodeo bull unit. 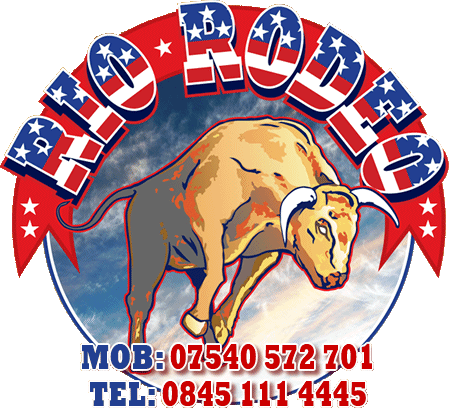 If false information is given to the operator concerning this aspect and an injury is sustained, Rio Rodeo will not be held responsible or liable. What electric power source do you require? For all venues indoor or outdoor we would require a normal 13amp power socket. What happens if there is no electric available? No problem – we would supply a generator but there may be a small extra charge. Normally around 4hrs, although we will endeavour to cater to your needs. What happens if it is raining or windy? Weather conditions do apply. We can provide an inflatable marquee cover, however this does require more space (approximately 25ft x 25 ft square and 15ft height). If the weather conditions are due to be extremely windy but dry, our preference would be for the unit to be used inside as sometimes ground spikes do become loose which could be potentially dangerous. It is a recommendation of HSE that inflatable equipment should not be used at all in wet conditions, so again, our preference and for safety’s sake (remember, this is an electrical item) would be to move the unit to an indoor facility. Refunds due to adverse weather conditions are entirely at the discretion of Rio Rodeo, and are offered in accordance with our terms and conditions. What happens if I need to cancel and want a refund? Cancellations prior to one month of the event would hold you liable for the loss of your deposit. Any subsequent cancellation within one month of the contracted booking date would hold you liable for the full contract price unless we are able to rebook the equipment elsewhere, again please see our terms and conditions.